What will the world look like when cloud compute and storage are free? Cloud computing prices are hurtling to zero. 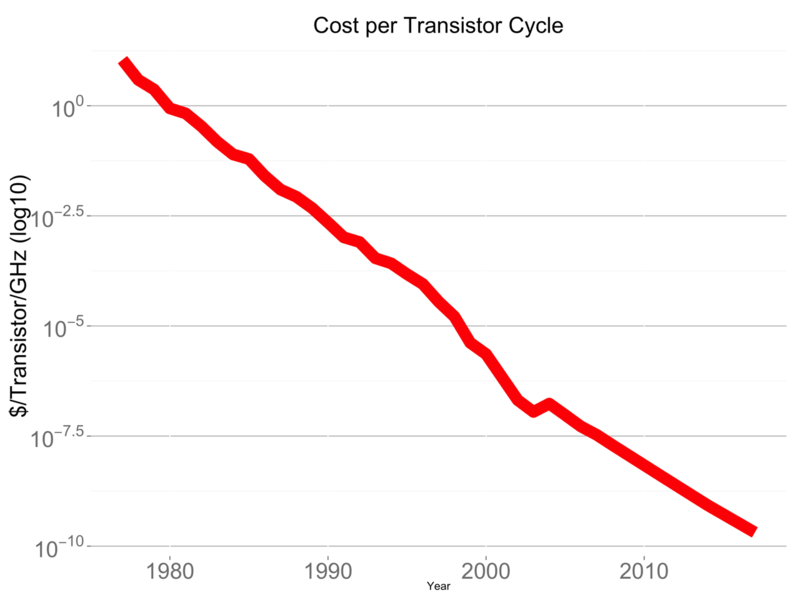 The chart above shows the logarithmic decline of the cost of a transistor cycle by 11 orders of magnitude (11 decimal places) over the past 40 years. AWS has decreased prices for EC2, elastic compute cloud, and S3, simple storage service, 42 times in eight years. Storage is following a similar path. Dropbox is now selling 1TB for $10 per month and Google offers 10TB for $100 per month. Meanwhile, gigabit internet has been deployed in about 8 cities in the US so far with another 12 to 15 slated for next year, typically at $70-$100 monthly price points. Presuming the trend continues, and computational power becomes free, or near free, what new technologies are enabled by it? The first manifestation of large scale, near-free compute I’ve seen is in machine learning. When I worked at Google in 2005, we would test individual machine learning models one or two at a time. Today, it’s possible for any company to test millions of machine learning models in parallel in minutes by distributing the work across tens, hundreds or thousands of machines with the push of a button. These advances will shape the next era of SaaS companies and consumer companies pursuing anticipatory computing, and nearly everything in between. The second manifestation is Bitcoin, which could become the next major protocol for the internet. Bitcoin miners use huge amount of processing power to validate transactions between buyer and seller of the currency. Without access to this computing power, the blockchain, which is the ledger of all Bitcoin accounts, could quickly be hacked and the currency destabilized. The third manifestation is next-generation databases, like Redshift, that enable data processing on a massive scale with sub-second response times. The benefits of these databases have already cascaded to business intelligence and will undoubtedly benefit other fields. Access to near-unlimited computational power and storage will define many of the key technology innovations in the next decade. This transformation enables startups to challenge the first order assumptions about what can and can’t be done, and will surely lead to explosive innovation.